Seeing all the curry bentos the last week or so had me craving badly, so off I went to the super to grab some porkloin and potatoes for curry! The top tier has pork curry made from S & B #5 (Spices & herB according to their website :P), with a little butterfly carrot garnish. The curry doesn’t look that attractive, but fact is, I like it with lots of sauce to slather all over my rice. The bottom tier has steamed plain rice that’s prettified with a flower scene. 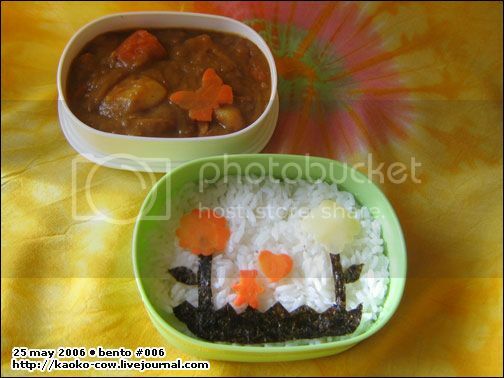 The cut-outs are made from carrots, potatoes and nori. 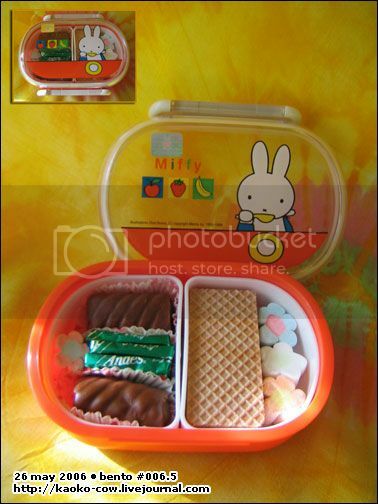 And because I’m itching to use my new Miffy bento box, I decided to pack a little treats bento. On the left side is a pair of Hershey’s Mallow Blasts, they’re chocolate-coated twisty marshmallows with strawberry filled centers. The green foil things are Andes Creme de Menthe thins, one of my favorite chocolate treats. On the right side is a pair of Nissin Choco Wafers. I added a few marshmallow flowers for more munchy-chewy fun.